The i7-7740X has top of the line single core performance, but lags behind six and eight core processors in multi-threaded workloads. Anandtech have managed to push their CPU to 5.0 GHz stable on all cores. This could indicate better binning than the i7-7700K, but a quad core is still on odd choice on the enthusiast X-series platform. We also noted that the stock performance difference from the i7-7700K was somewhere between non-existent and tiny. 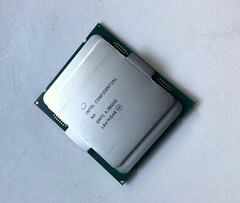 The i7-7740X is essentially an i7-7700K with a 100 MHz higher base close, a 17 Watt higher TDP, and a US$40 higher price tag. You also must factor in a more expensive X299 motherboard at approximately US$100-120 more than a standard Z270 board. Overclocking is where the difference between these CPUs starts to show. Anandtech has tested their i7-7740X overclocking performance using air cooling and managed to get it to be stable with all four cores running at 5.0 GHz. This is in comparison to multiple i7-7700K samples which they had running between 4.6-4.8 GHz stable. While this is a small sample set, it may show that the Kaby Lake X chips are at least better binned than the standard K-series. Even with the i7-7740X running at 200-400 MHz higher than the i7-7700K, it might not justify the extra cost for the ecosystem. For those who don't need the features of X-series, they're probably better off saving some money. For those people who have a use for an X299 based system, they're likely to be better served by buying a proper enthusiast chip like the 6C/12T i7-7800X (US$416) — but not for gaming.